The Spanish Steps is another tourist spot that you should visit when in Rome. Just across the steps, you will find tons of luxury stores but also more affordable brands further down. The Rick Steve’s book had suggested Il Gabriello, but my mom had thought it would be too expensive. Minutes after persuading her, we finally ask for a seat and were told there are none. So apparently, you’re supposed to make reservations here! We ended up making a reservation for the next night, and it was the best idea ever! Atmosphere is lovely, and service was great! The restaurant is underground so it’s pretty cozy. A huge variety of wines here too, but they didn’t even give us any attitude when we just asked for water. If I remember correctly, the bread was complimentary, which was a bit surprising, since many places we had gone charged us for extras. Water, however was charged since they don’t give out tap water. The assortment of bread was really good though! The loaf was alright, but the little buns were so soft! The bread sticks were also really nice! The Smoked Salmon Salad was so good! The salmon was really fresh and mixed with the greens, it was a nice way to start the meal. Really refreshing and light! This is a must order for octopus lovers! At first, I was worried the octopus would be tough, but it was so soft, yet still had a nice chew! It came with some potatoes and a nice light dressing. Absolutely delicious! K got the Lobster Linguine which was a simple tomato based linguine and came with a large portion of lobster. Very fresh, and the linguine was cooked perfectly to al dente. Keep in mind that we had also ordered the primi sizes, which are supposedly smaller. E got the Mushroom Risotto, which he said was also really good. It looked really creamy! C got what I believe is the Seafood Paccheri. Paccheri are large tubular pasta. Again, it came with a nice tomato sauce, and came with a variety of prawns, shrimps, and a lobster claw. For myself, I didn’t go for the pasta but opted for the Grilled Lamb Chops. I sort of wish I had gotten the pasta after trying the others. Still, the lamb chops were pretty good. They were simple, and the sauce wasn’t overwhelming so you could get the true taste of the lamb. A got the Seabass, and she was surprised to see it come as a whole. I guess we aren’t familiar with seeing fish as a whole in Vancouver, other than in Asian cuisine. No worries though, since A loves her fish and enjoys eating a whole fish. It came with a tomato sauce on the side which also had clams in it I think. She said the fish was very fresh and grilled nicely. For dessert, we had the Pistachio Hazelnut Crepe, which I found a bit pricey for the portion. It was quite delicious though, with tons of Nutella filling and pistachio nuts on the top. Overall, I highly recommend going to Il Gabriello. Good quality and authentic Italian food! Remember to make those reservations! After, we headed to see the Pantheon, and also stopped by Il Gelato di San Crispino, which is known to be one of the best gelato shops in Rome. They have really unique flavours here. Made from fresh fruits or the actual ingredients. Here, we got the double scoop of Pear and Chestnut. Pear was my favourite as it was sort of like a sorbet. Very strong in pear flavour too! We also had the Chestnut which K really liked, but I thought it was only average. Overall, really cool place to try out some flavours you might not find elsewhere. The quality of the gelato was also really good. Today, it’s not going to be a food post, but a post about my travels to Pompeii! I was seriously so excited when I found out we were going to Pompeii. It’s sort of a childhood inside joke K and I had since I had learned about Pompeii in elementary school, and I remember coming home telling her all about it. We had thought the name sounded funny and were amazed that people were buried alive and all. And since then, it was always a place I wanted to go see. Anyways, we were in Rome, so we decided to take a train to Naples, then connect another train that took us to the city of Pompeii. It was out of the way, and expensive, but I knew we had to do this. For those of you who don’t know much about Pompeii, it’s an ancient town near Naples in the Campania region. The town probably existed back in the 6th or 7th century, but was destroyed and buried from the eruption of Mount Vesuvius in 79 AD. The town was then forgotten, until 1599, when they began to dig and discovered ancient walls. Pictured here is basically a road or street that horse carriages would go down along, with the houses on the sides. You could tell that the houses back then were already pretty structured! This is where the city center of the town was. Probably where it was most busy and where they had temples and such. It’s basically “The Forum“. In the background, you can see Mt. Vesuvius, although the mountain used to be fuller and higher. If you took the right hand slope and connected it to the top, that was what the mountain used to look like, until it erupted. People were basically buried alive, and it’s amazing how the structures are still in tact today. You will see a case of plastered victims as they have been able to preserve them. If you’re planning to visit Pompeii, I would highly recommend you to bring a guide book, like the one I used by Rick Steves. Or you can also pay for a guided tour, but honestly, I was reading the guide book to my family, and we were learning the exact same things I overheard the tour guide speak about. Otherwise, if you just venture into the ruins on your own, you will have no idea what you’re looking at, and it won’t be as interesting. Overall, I highly recommend taking this one day trip here! You can get off at Pompeii Scavi by the train which departs from Naples. Warning though, is that the Naples station is not really luxurious. People are smoking inside and it’s known for pickpocketing, so be careful of that. If you have more time, you can also take a look at modern Pompeii, as well as train back to Naples and explore that city. I wish we did, since they have amazing pizza! Too bad we had to catch our train back to Rome. A must see in Italy though! I personally think this was much more interesting than the Roman Forums in Rome. Our next stop was Rome! We arrived late at night by Ryanair and landed at Ciampino Airport, which is not their primary airport. Oh god… it was a nightmare in the airport. The arrivals was so small, but that wasn’t the problem. It was the fact that people were sleeping everywhere on the floor (waiting for layovers?) and the fact that people just smoked indoors. We were all pretty disgusted with the smoke just surrounding us. I have to say that the departure side is much better though and I had no problems with that. Anyways, we took a taxi to our hotel called Hotel Romae, which is just minutes away from the Termini station. A nice, comfortable hotel at a reasonable price and they even had Pantone chairs! How stylish. The next day, we were off to see the Colosseum. I’ve been here before, but I felt like I learned so much more this time around. If I remember correctly, we got the full entrance ticket, which gives you access to the Colosseum, the Roman Forums and Palatine. This was around 12 euros. We also paid an additional 9 euros for the Guided Tour, where the tour guide takes you underground and also to the third ring. The Roman Colosseum was the largest amphitheater of the Roman Empire and is also the largest in the world! This was where spectators could come watch gladiators fight animals. The guided tour was pretty cool since were were taken underground and could see where the elevators used to be to rise the animals up. This here is the underground structure called the hypogeum. It used to be covered by a wooden floor topped off with sand. Now, you can only see these structures, but you can imagine the tunnels and cages where the animals were kept. Since we bought the guided tour, we were also given access to the third floor. You get some nice viewpoints here. We then made our way to the Roman Forum. I think some of us were a bit disappointed with it just because it’s literally just ruins. Just looking at the place with no understanding really doesn’t impress you. We were lucky to have the Rick Steve’s Rome Guide book, and we instantly were much more interested. So basically, this area used to be a plaza and this was the center of the city. It’s where government buildings, marketplaces, temples ans such were located. Here, you will also find the Temple of Caesar, where Julius Caesar is buried. We also headed to Palatine Hill after, which is sort of an extra if you have time. We didn’t find it too intriguing. You’ll basically see what’s believed to be the residence of Augustus’ wife and also the Flavian Palace, which housed the Roman Emperors. At night, we ventured the streets, wandered into shops and ended up at the Trevi Fountain. It is the largest Baroque fountain in the city and obviously, it’s well known due to many films being filmed here. The fountain actually is located at the end of the road and is the terminal point for the aqueduct. Well in pop culture, we are often told that if you throw a coin in the Trevi Fountain, you’ll be coming back to Rome again in your life. I did this just 7 years ago, and here I am. I did it again this trip, so hopefully I’ll be back again! Do keep in mind that there are many pickpockets here, so grab on to your belongings! For dinner, we went back near the Termini station to look for dinner. We ended up going to Ristorante Da Giovanni, which was recommend in Rick Steve’s guide book. It’s a family restaurant, but unfortunately, we were not too impressed with the food. I got the Spaghetti alle Vongole, which is very popular in Italy. Basically spaghetti with clams made in the “bianco” way. This means with oil, garlic, parsley and white wine. Maybe, this is the traditional way, but I found it very bland. It wasn’t like “wow this is amazing”, but more like “it’s average.” Prices were definitely very reasonable at around 7 euros a dish though, and service was quite friendly. I guess if you’re just looking for something simple and cheap to get filled up, then it might not be too bad. Otherwise, I would skip this restaurant. We had settled at this restaurant that had what was called a “tourist menu”. Now most of the restaurants in Venice basically have this. They also have something called a cover charge. Cover charge is essentially a charge per person for just sitting outside. Actually, I’m not sure if you need to pay a charge just for sitting. But we sat outside, and this was added to our bill. Not to mention that service was just terrible. And they expect you to tip here… Service like that really does not deserve any tip. Anyways, K and my sister order the tourist menu. If I remember correctly, it came with a salad, pasta and another dish, which I wish I could remember. This was their pasta dish which was Spaghetti with Clams in a White Wine Sauce. This was actually pretty good! It had a lot of clams and the pasta was cooked to al dente. For myself, I ordered the Seafood Risotto, which was off the regular menu. I absolutely loved this. It was a bit pricey, but I think it was still under 20 euros. It was really good though! The rice was cooked to perfection, not too chewy and not too soft. The sauce was amazing. There were bits of clams and shrimps inside and it came with three more mussels. The seafood was surprisingly quite fresh. Not the freshest I’ve had, but quite decent! Loved this dish. And now let me show you some of the shops around the city! Venice is basically filled with narrow streets which are really pedestrian walking only. Every once in a while, you would see the canal, and then you would enter just a street with buildings on both sides. It’s almost like a maze. Along these streets, you will find shops from bakeries, to pasta shops to mask shops and etc. 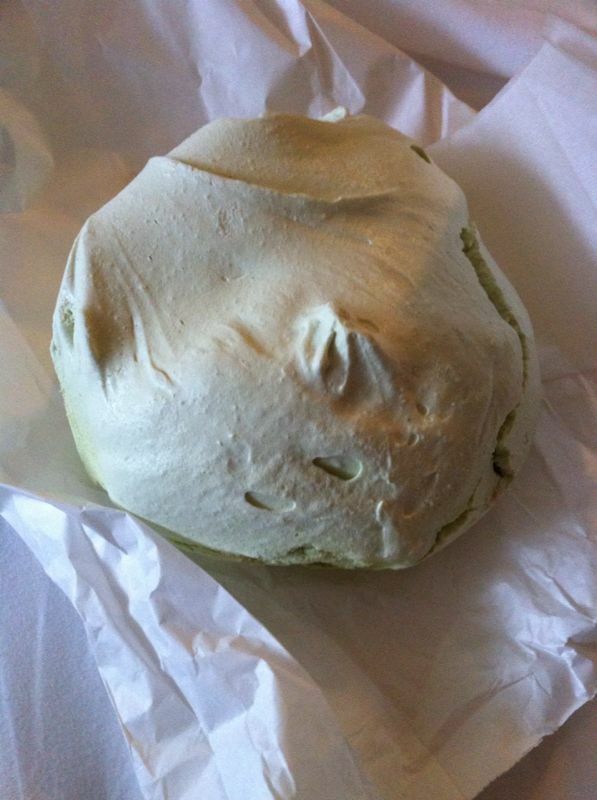 It’s extremely popular to see these shops that sell almond cookies and these gigantic meringues. If you’ve been to Macau in Asia, my friends told me that is what Venice really reminds them of. There are also tons of pasta shops! Well Italy is famous for pasta, so it’s no surprise. They claim they are handmade, and I was just drawn into their colours and detailed patterns. I love how they are shaped into Venice infrastructure, gondolas, hearts and much more! The colouring is also natural as they are made from vegetables or spices, which is pretty cool. More pasta! I thought these were pretty cool since it was curry flavoured. They also had some truffle flavoured ones. Mmm! And yea…we ended up getting some gelato again. This was amazing because it was pear flavoured! I love how the Italians use every fruit they can think of. Super refreshing. Underneath is a scoop of pistachio. I can never get enough of that. And last but not least, I’ll finish this post with a picture of gondolas! I didn’t get a chance to take one since they are quite pricey and wasn’t worth it when we only had three people. Also note that these guys don’t actually sing… Thought it would be all romantic like in those movies…Nope! Oh well, Venice is still a beautiful city to visit! Jealous of anyone who is heading there! Next post: we head back home to Barcelona! Mignon! Yes I believe this is what these cute mini pizzas are called. I call them pizzas since they are really a squished down bun filled with ingredients on the top. This one was ham and cheese, except sometimes they surprise you with an olive right in the middle. This place was near my hotel, which is near the Lambrate metro station. It’s called Pizzeria Mundial and after doing a quick search, I realized that it’s actually quite popular! They are known for their warm and soft dough and they offer a variety of other products, including pizzas. This place is very busy most of the day, especially in the mornings, so you need to be quick before what you see is sold out! For dinner one of the nights, we were tired and strolled around the luxury shopping area to look for food. Of course that’s a bad idea because everything is expensive in that area! We wandered into this mini square which had a few cafes and bars that looked more affordable. We saw the sign saying Free Wi-Fi and we immediately fell for it since we were desperate for some Internet. Not sure what the place is called, but it is a cafe. We sat outside and ordered a few dishes to share. This is the Caprese Salad which is very typical in Italy. However, this one came on bread! It is essentially fresh buffalo mozzarella cheese with tomatoes, basil and olive oil. The cheese isn’t strong and it has a rubbery texture to it which I really like. I’m not a fan of tomatoes, but this whole dish really goes well if you eat everything together! We also got a Ravioli with Ham. When in Italy, you eat pasta. But honestly, I don’t think this place was great for pasta. Their pastas are not handmade nor fresh, so it was quite a disappointment. Price-wise, yes – they are definitely cheaper, hence what we get. We also shared a Carbonara, which again was just alright. If you have the chance, be sure to try some good carbonara though, as it is famous in Italy, especially in Rome. It is an egg based pasta dish and can be quite filling. Pretty much when we have nothing to do and are thirsty, we end up going to a gelato shop. They are everywhere and these were mostly around the Duomo area. On our first day, we literally went to three gelato shops in the day. One time, it was one after another. Literally gelato shop hopping… Anyways, I think the coolest thing about some of the shops I saw in Milan were that their gelato are filled with fruits or the actual product of the flavour itself. For instance, I was addicted to their melon gelato, because you would actually get bits of melon in it and it was a thirst quencher on a hot day. If you really prefer creamier gelatos, then those will also have ingredients in it such as the bueno chocolate wafers. I got the Melon and Tiramisu I believe. If the shop has banana, you should also give it a try! It’s pretty good! I became addicted to trying a bunch of fruit gelatos as they are much more light. One morning, we wanted to go to Luini again, but it was unfortunately closed. We settled at a cafe where we saw Italians taking espresso shots in their tiny Illy cups! They would literally stand at the bar, take their coffee and head off to work. My sister wanted to try that, so we headed in, but after looking around to figure out how the system really worked, the server told us to just take a seat. I guess we looked too touristy to know what we were doing. I guess standing to take an espresso in Italy remains on her checklist now. Anyways, we tried to figure out the menu, and they had some sort of special about a coffee and croissant for a set price. Keep in mind this is all in Italian and we don’t know any other than “cafe”. So we each got a cafe with a croissant. I chose a cappuccino, and I don’t normally even drink any type of coffee. The closest thing is a Starbucks white chocolate mocha, but that’s about it. But heck, I was in Italy, so why not. Illy is known for their high quality of coffee, and seriously, after this coffee, I have begun to enjoy my cappuccinos. Not sure if that’s a good thing since I’m afraid of being caffeine-addicted, but that was seriously some good cafe! As for the croissant, it was more than a typical plain croissant. They had a sticky jam in the middle which made it ten times better. It was so flaky! Absolutely one of my favourite croissants I’ve had in Europe. Sad news was our Italian had failed on us. Our bill ended up being twice what we had imagined. We didn’t bother questioning since we didn’t want to cause a fuss and we probably wouldn’t have understood what they said. However, now that I think about it, I’m pretty sure the deal was for people who stand at the bar only. It’s kind of a weird system in Europe, but most places charge you less if you take your coffee standing at a bar. If you require a seat, then the item becomes double the price. Kind of silly, but I guess Europeans who usually sit down will literally just order a coffee and sit there for half a day. Turnover is then very low and hence they charge you more. I guess it only makes sense in Europe! Last but not least, another gelato! This was lemon and mango. Extremely refreshing! 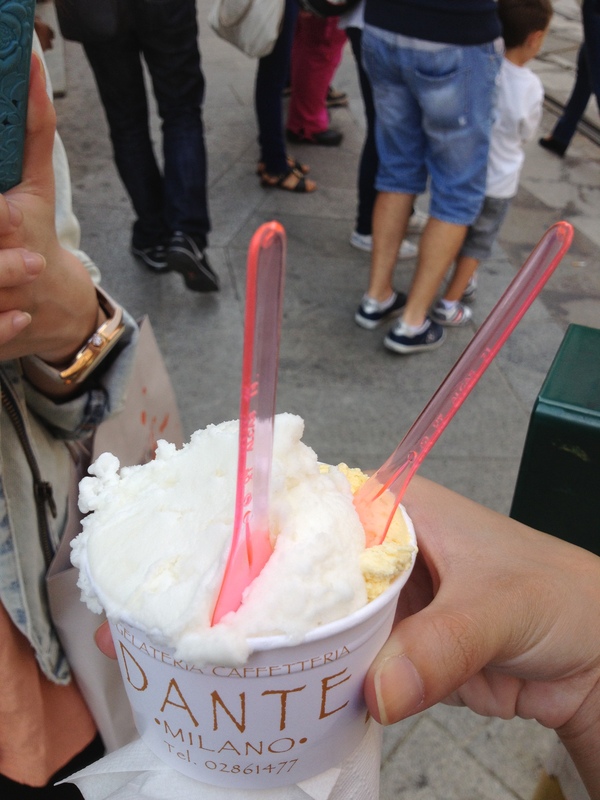 We literally ate gelato everyday in Milan! Now off to the next city…”city of water”… can you guess where? As students on a budget, we often end up eating on a budget. Milan definitely dug a hole in our wallet as we could not resist the shopping. What ends up happening is we either don’t eat or we eat cheap. Since I don’t like to sacrifice my stomach, I choose to find alternatives for food. And yes, we end up at McCafe. I mean, McCafe isn’t exactly cheap as well, because compared to Canada, McDonalds in Europe is actually quite pricey. But it is probably one of the cheaper options in Milan. We chose to get the dessert combo deal, where you can get a small drink with a dessert for a set price. I ended up getting a Cappuccino with a Tiramisu, while my sister got the Strawberry Cake. The tiramisu was actually really good! It was moist and had a strong coffee flavour. The cake was also not bad, and for the price we paid, we were quite satisfied. It’s always interesting to check out the McCafes in Europe because each city has a different menu! Milan is a fairly expensive city to travel in as food and accommodation can be said to be more expensive relative to some other European cities. Therefore, finding food was a struggle, especially when we had all emptied our wallets after a long day of shopping at the outlet. We hadn’t researched which restaurants were good and local before arriving, and with no data on our phones, it definitely wasn’t the best idea. I’m someone who doesn’t want to be trapped in a tourist restaurant, or eat somewhere that is only mediocre while being expensive. I should’ve totally done my research, but I got lazy. However, my sister had done a quick search and remembered that people had recommended Luini Panzerotti for a cheap snack. Desperate for food that was cheap and filling, we headed off to look for it. It actually took us quite a while to find it as we walked into many alleys and made lots of turns. However, we realized that it was actually really close to the Duomo…So if you are looking for it, do not make the same mistake we did! It’s super easy to access as a tourist! When we got there at around dinner time, there was a huge line out the door. And everyone who had just bought their panzerotti were also eating outside, as they do not have sit in tables. The line moved fairly quickly, and although their menu was huge with tons of different flavours, there were only two choices left at that time. I believe they were just trying to sell the last few batches, but luckily they were the most popular and typical fillings that a first-timer should try anyways. I chose to get the Baked Luini filled with Mozzarella and Tomato. This is their original and classic panzerotti. So what exactly is this panzerotti? Well, if you’re from North America, I’d compare it to a pizza pop or calzone, since we ate tons of those as a child. However, panzerottis actually originated from central and southern Italy, where it is said to have way better ones than the ones at Luini in Milan. But unless you are prepared to go there, then this will do! They really do remind me of pizza pops or calzones, but the dough is much more soft. It almost has a bread dough texture, whereas the pizza pops we eat in North America are harder. Sadly, I have to say I love the texture of an Italian panzerotti much more! When you bite in, the dough is soft, and the cheesiness of the mozzarella just makes everything so much better! However, I do find that the flavour is a little bland, but it’s perhaps due to the fact that there are only two fillings and both are not salty flavoured. I’m guessing ones that were filled with ham or another meat would be much more flavourful. As well, Luini Panzerotti has fried luinis and sweet luinis! Kind of cool, but sad that I wasn’t able to try as they sold out. The next day, I tried to grab lunch with my sister there again, and they were renovating! Either they were closed on that day, or they were taking a break. So we were extremely lucky to have tried it out! Definitely check out their opening hours, as I don’t believe they are always open. It’s worth a try, and it will definitely fill you up for cheap!